Our industry-leading doctors are equipped with the latest knowledge and techniques to help you through this treatment. By offering chemotherapy, biotherapy, immunotherapy, and adjunctive support, we are able to serve all of your hematology, oncology, and rheumatology disorders at our infusion centers. Infusion therapy is simply using a needle or catheter to pass fluids into the veins for the purpose of treating a condition or disease. Most think of chemotherapy when hearing the term the most common use of infusion therapy is the delivery of fluid to combat dehydration. Infusion therapy is used as an alternative to oral treatment or when the disease responds better to medication infusions. Antibiotics, antiviral medications, vitamins, water, saline solution, electrolytes, anti-fungal medications, and more can be delivered via an intravenous infusion. In addition to common medications and general treatments, infusion therapy is ideal for the delivery of many specialty drugs such as custom pharmaceutical compounds for chemotherapy and the delivery of radio-pharmaceuticals in nuclear medicine imaging. What is Infusion Therapy for Cancer? 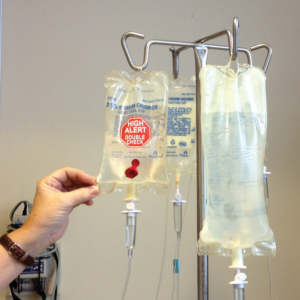 Infusion therapy for cancer is often part of chemotherapy, but the two are not the same. Specialty medications are created by the pharmacist and then infused into the patient through an IV tube as part of chemotherapy are delivered via infusion therapy. But chemotherapy is called a systemic or body-wide treatment. Why Would Someone Need a Blood Infusion? Some blood diseases require regular infusions of blood. The reasons could include treating a severe infection, liver disease, or an illness causing anemia. Certain medications and radiation can also cause anemia, which may result in the need for an infusion. What is the Difference Between an Infusion and Transfusion? The two terms are similar in that both refer to the movement of blood or other fluids via IV, but the term transfusion applies only to blood. The blood itself is said to be transfused, but the method is via infusion. What Can Patients Expect When Receiving Infusion Therapy? Infusion therapy involves inserting a plastic tube into the patient’s blood vein to receive the fluids to be infused. Trained therapists will insert the tube using a specialized needle set then secure the tubing to the patient’s wrist or arm. Depending on the fluids to be transfused, the nature of the disease treated, and the medications to be added, the procedure can take anywhere between half an hour to several hours. Much depends on the precise treatment to be given. Your Physician or his/her assistant can explain the entire procedure to you beforehand if you like. Feel free to ask us anything about your treatment you like. We want you to be as comfortable as possible with your treatments. How Can You Prepare for Infusion Therapy? If your procedure is to be extensive, we recommend bringing something to read. If you bring your cell phone for a long-duration infusion, be sure to bring a backup battery pack for we cannot guarantee access to an outlet for charging. Wear comfortable, but appropriate clothing and be sure to bring along a light jacket. Some fluids cause chills and a light jacket is nice when that happens. Eat well unless you are told to fast ahead of time. Drink plenty of fluids. Although you will be receiving fluids, if you are properly hydrated beforehand, administering the IV will be easier for both the technician and yourself. Get plenty of rest. Proper rest before getting an infusion will help. Provide full disclosure of your medical history including all drugs you take, over-the-counter, prescription, or illicit. How Long Does a Chemotherapy Infusion Take? Treatments for chemotherapy can take anywhere from an hour to 10 hours. Your doctor can give you a better idea how long your chemotherapy infusion will take when scheduling your appointment. What Diseases or Conditions are Treated with Infusion Therapy? With infusion therapy, medications are “infused” directly into the bloodstream of a patient via intravenous tubes. At Kymera Independent Physicians, we pride ourselves on advanced, compassionate care and treatments. We hope we have been able to answer many of your questions about Infusion Therapy in general. If you are a patient or considering becoming a patient know that we are happy to answer all your questions to your satisfaction. We know that infusions may be frightening, even daunting. But know that we are here for you. For more than two decades, we have been helping patients from all walks of life. We can help you too. With convenient treatment center locations in SE New Mexico, Kymera delivers a better healthcare experience.